Explore the pageantry of the past at Great Britain’s mightiest medieval fortresses. The Iron Ring Tour of Wales explores the legacy of King Edward I and the most ambitious castle-building campaign of the Middle Ages. Beginning in 1277, English King Edward I- also nicknamed “Longshanks” and “the Hammer of the Scots”- launched a fearsome military campaign to subdue the powerful Welsh princes. He funded the construction of a series of formidable fortresses throughout northern Wales known as the “Iron Ring”. The Iron Ring Tour takes us up-close-and-personal with the most extraordinary collection of thirteenth century castles located throughout northern Wales and digs deep into this military legacy left by King Edward I (1271-1307). Some of this tour’s highlights include a visit to Caernarfon Castle, where the Prince of Wales has been invested since 1301, the bastide town of Conwy with its complete medieval walls and grand castle, and a trek into the breath-taking landscape of Snowdonia National Park. Wanderlust Tours owner and architectural historian, Shawnie Kelley brings to life castle history, famous faces, construction techniques, and innovations of Edwardian architecture during your private guided seminars. Our meals showcase traditional surf and turf dishes from around Wales, drawing on the fantastic seafood from the coast and agricultural offerings of the countryside. Plenty of beer, cheese, and local fare is in the mix. In 1254, prior to becoming King, Edward was named Lord of Chester- a Welsh border town associated with powerful medieval earls. Our group meets in the ancient market city of Chester, renown for it’s Roman ruins, beautiful red sandstone cathedral, and Tudor architecture. It was from here Edward launched his military campaign into Wales, making this a fitting starting point for our foray into northern Wales. We spend three nights in the heart of Chester’s Old Town, where we enjoy our first dinner together at a lively old pub. Our first full day is spent exploring Chester, the city where Edward rallied his forces. During our guided walking tours through town, we learn about the background of the Welsh Wars, Edward’s ambitious castle building plans, and his genius royal architect, James of St. George. Our wanderings take us past winding alleys, medieval bridges, towers, Chester Castle, and along the city’s well-preserved medieval walls (which happen to be built on Roman walls)- some of the finest in England. Lunch and dinner are shared together. After breakfast, we make our way into Northern Wales with stops at Edward’s earliest castles: a quick look the ruins of Flint Caslte, where Edward staged the invasion, then on to the imposing riverfront fortress of Rhuddlan (c.1277). We spend some time looking at its unique diamond plan and head on to the fortified town of Conwy for lunch and a private guided tour of Conway Castle (c.1283)- one of the medieval era’s most evocative and finest example of military architecture. You’ll have free time to wander the town and waterfront and take lunch on your own. We stop for a few scenic photo-ops en route back to Chester, where we have dinner and few pints in a lively historic tavern. Prepare to move into Wales, as we are transferred to the town of Caernarvon, where we stay in the shadow of the great castle for 3 nights. We spent a large portion of the day on the unspoiled island of Anglesey, just off the north coast of Wales. Here, we visit Beaumaris Castle (c. 1295) with its extraordinary towers, moats, and walls- one of Master St. James lifelong projects. After lunch, we rewind a few thousands of years with a visit to ancient standing stones (the Druids once lived here!) and burn off our lunch with a short hike through some of Wale’s most beautiful coastal scenery. We arrive in the town of Caernarvon in time for a lovely, local-inspired dinner. We break from castles for an active day outdoors. This is what Wales is famous for! Be sure to fill up on a hearty breakfast as we spend an active day trekking about Snowdonia National Park. A private driver gives us the lay of the land, making it clear what Edward was up against in terms of geography. We drive through some of Great Britain’s most rugged landscape, stopping for photo ops at beautiful bridges, waterfalls, and historical sites. Bring good hiking shoes, as this excursion involves a few long walks – the views will be worth it. In between, fortify on a traditional Welsh lunch and drinks. When we return to Caernarfon, enjoy dinner on your own— or pass out in bed. You’re given a leisurely morning to recoup from yesterday’s activity. Later in the morning we take a guided tour of Caernarvon Castle, sprawling along the Seiont River. King Edward and his wife Queen Eleanor lived here when their first son, Edward II was born in 1284. We’ll learn how the title Prince of Wales came to be and see the spot where nearly every heir apparent to the throne has been invested since 1301. We take a short afternoon excursion down the coast, stopping for a light lunch in a scenic country inn then it’s off to visit another brute of a building, Harlech Castle (c.1289). Looming above a 200-foot spur of rock overlooking the Irish Sea, this late Edwardian castle, played a part in later wars as well. 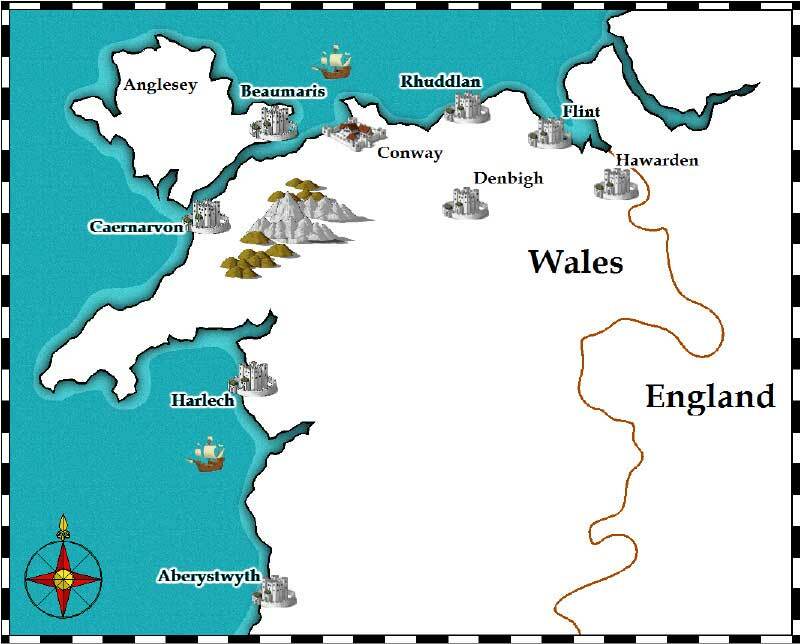 We’ll learn about its links to the War of the Roses, English Civil War, and deep Welsh mythology. We enjoy a traditional Welsh dinner together in Caernarvon, replete with music. Our final day is spent leisurely making our way back toward the Cheshire countryside, stopping at a few leafy villages known for their covered markets, links to England’s many kings, and affluent living. We’ll shop, lunch, and wander along a few different Kings Streets in a few villages referred to as the Golden Triangle. We’ll make as many stops as time permits before arriving at a charming inn located between Chester and Manchester. This final day is evening winding down with a wonderful meal prepared at the inn, sharing experiences, and preparing to depart. Day 8 Farewell & Cheerio! Our tour comes to a close in Chester, but we are happy to help you arrange transportation from the hotel to the airport or your next destination. Our tour begins on in the northern town of Chester, England, an important border city since the Roman era. We spend three nights here, using Chester as our base to explore into northern Wales while the next three nights are spent in a Welsh country inn.